In order to keep your muscles strong, you must stress them by resistance training. 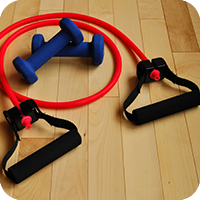 Dumbbell weights or resistance bands are great ways to strengthen your muscles. Resistance bands are great because they are easy to travel with. Take them on your next business trip and you won't miss a workout wherever you are.